The Table Track, which runs from the end of the Glenmalure Valley, rises to 694 metres altitude, and passes within a few hundred metres of the summit of Camenabologue. 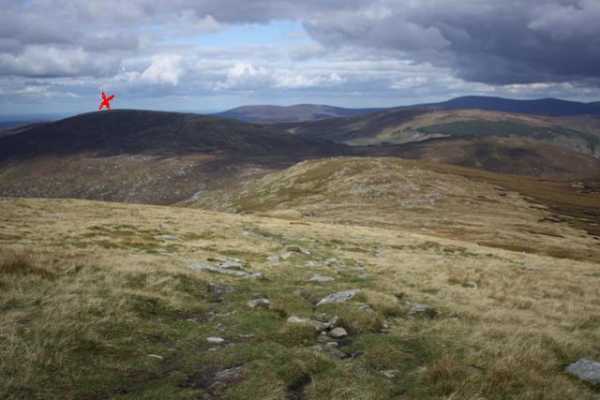 This gives straightforward access to this high Wicklow Mountain. Once across the ford, follow the good Coillte track for several kilometers higher into the valley until you reach a junction at T03458 96141 B which heads up over open bog. This bog track, interspersed with short pieces of wooden boardwalk over the worst boggy sections, leads to the col between Table Mountain and Camenabologue at T02085 96698 C. Leave the Table Track and walk south. From here it is an easy 10 minute ramble to the summit of Camenabologue. Total lenght from carpark to summit is 6.5 kms.